Last night, I was abducted by aliens and transported to Wembley Stadium, which had been kitted out in the style of Friz Lang's Metropolis for its second visitation by rock's rockingest paranoiacs, Muse. Football ground gigs are often underwhelming, because it's like listening to music in a chamber of mirrors, so Muse's sound crew deserve some sort of award because the Devonshire trio's wilfully apocalyptic guitar crunch was as sharp as a pin. They came on stage bearing flags - Matt Bellamy dressed up like a human glitterball, and Chris Wolstenholme in a stripey suit that made him resemble a human humbug. 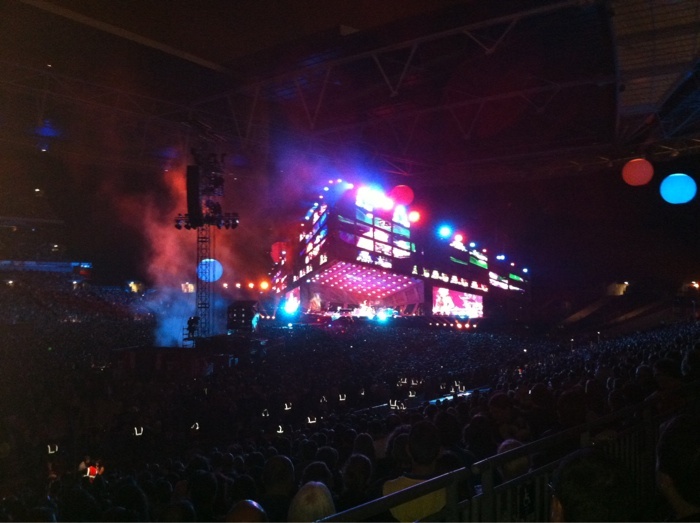 Above them, a tower block of video screens lit up like windows, with the silhouetted occupants holding up placards to spell out the song's radical rallying cry of "they will not destroy us". A clever move - immediately reinforcing the "one for all" bond between the audience and the group, who sometimes suffer from a propensity towards surly introversion. So the songs bound us together and, when the crowd got hold of a melody, they never let go. Supermassive Black Hole, Plug In Baby and Feelin' Good provided the requisite arms-in-the-sky moments, and I watched three generations of the same family grinding out raucous air guitar licks over the top of Resistance. If I have a problem with Muse's current material, though, it is this: The backing tracks have taken precedence over the tunes. Matt Bellamy is frequently singing the root note of a spiralling, doom-laden chord progression, his falsetto circling higher and higher into the sky like a vulture. It's dramatic, yes, but sometimes you could tell the crowd were just sticking around for a BIG TUNE - like Starlight or Knights Of Cydonia. Funnily enough, the Muse messageboards seem a bit underwhelmed by last night's set-list, so maybe the occasional moment of "huh" wasn't unjustified. But even when the music failed to move me, the early sunset and overcast skies made way for a powerful and atmospheric light show. At one point, Matt even appeared on stage in Neon-lit sunglasses and an LED jacket (I was a bit far away, so it may also have been a regular jacket stitched together with hundreds of digital watches). 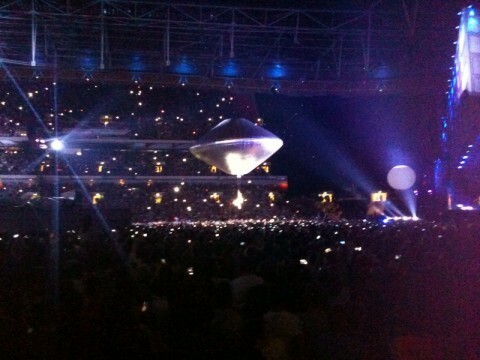 There was also a floodlit ticker tape explosion, an "actual" UFO and an illuminated, all-seeing-eye looming over the stage. Big Brother may have been wrapping up on Channel 4, but he was a constant, flickering presence at Wembley Stadium.